The Silver Pagoda is located on the south side of the Royal Palace, Phnom Penh. 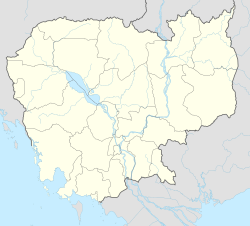 The official name is Wat Ubaosoth Ratanaram (Khmer: វត្តឧបោសថរតនារាម) as known as Wat Preah Keo Morakot (Khmer: វត្តព្រះកែវមរកត, "Temple of the Emerald-Crystal Buddha") which is commonly shortened to Wat Preah Keo (Khmer: វត្តព្រះកែវ) in Khmer. The vihara houses many national treasures including many gold and jeweled Buddha statues. The most significant are a small green crystal Buddha (the "Emerald Buddha" of Cambodia — some sources maintain it was made of Baccarat Crystal in 17th century but that's not possible since Baccarat Crystal didn't exist until 18th century, and other sources indicate it was made in 19th century by Lalique, a glass designer who lived in 19th-20th century), and a life-sized gold Maitreya Buddha commissioned by King Sisowath, weighing 90 kg and dressed in royal regalia and set with 9584 diamonds, the largest of which weighing 25 carats, created in the palace workshops during 1906 and 1907. 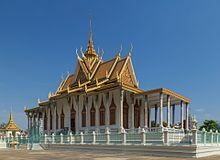 During King Norodom Sihanouk's pre-Khmer Rouge reign, the Silver Pagoda was inlaid with more than 5,000 silver tiles and some of its outer facade was remodeled with Italian marble. However, only a small area of these tiles are available to be viewed by the public on entering the pagoda. The wall that surrounds the structures is covered with murals of the Reamker painted in 1903-1904 by Cambodian artists directed by the architect of the Silver Pagoda Oknha Tep Nimit Mak. It is a notable wat (Buddhist temple) in Phnom Penh; Its grounds being used for various national and royal ceremonies. The cremated remains of Norodom Sihanouk are interred in the stupa of Kantha Bopha located on the temple's compound. Lenzi, Iola (2004). Museums Of Southeast Asia. Singapore: Archipelago Press. p. 200 pages. ISBN 981-4068-96-9. Wikimedia Commons has media related to Silver pagoda, Phnom Penh. This page was last edited on 3 March 2019, at 19:30 (UTC).